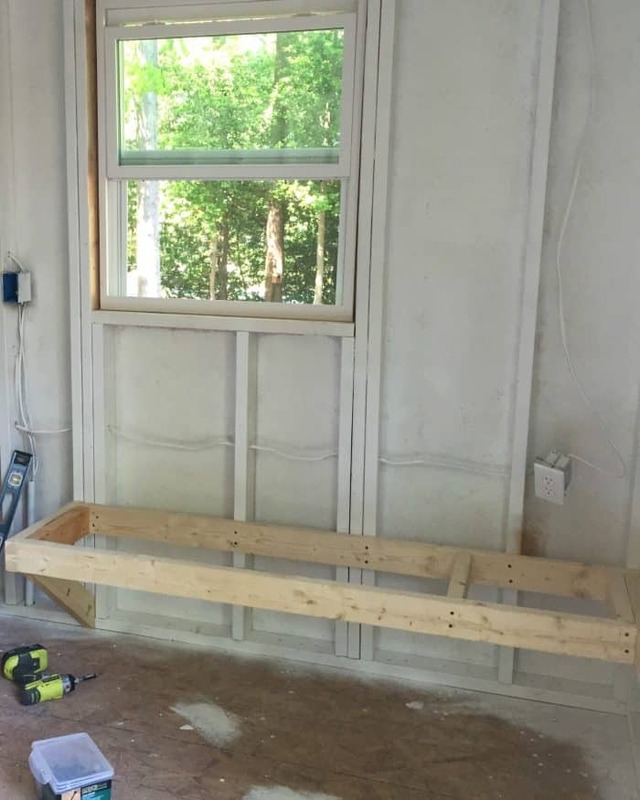 So here we are in week 4 with our One Room Challenge bench building update. We built a bench, and by we I mean mostly my honey! YEP, I just panicked a little by typing week 4. In reality I have about one week left to work because week 6 is the shed makeover reveal. That means as a blogger it’s crunch time. 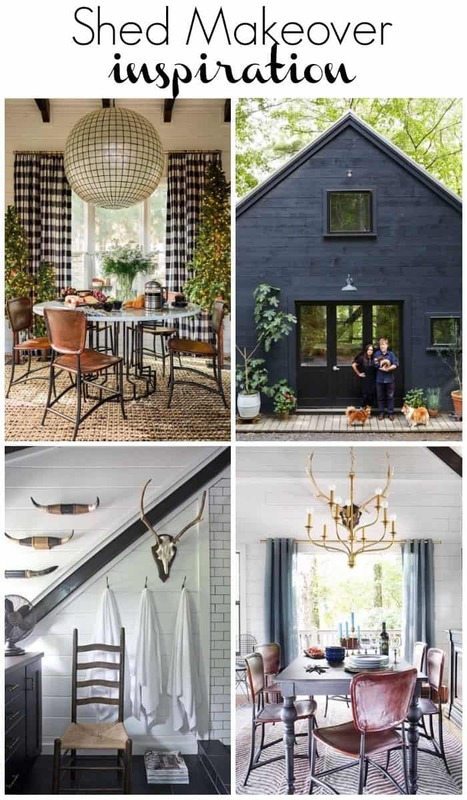 Once the makeover is complete there’s the final styling touches to the space, taking photos, editing photos, writing a post, editing a post all the while working on a million other things around our yard and house to get it ready for our son’s graduation party! 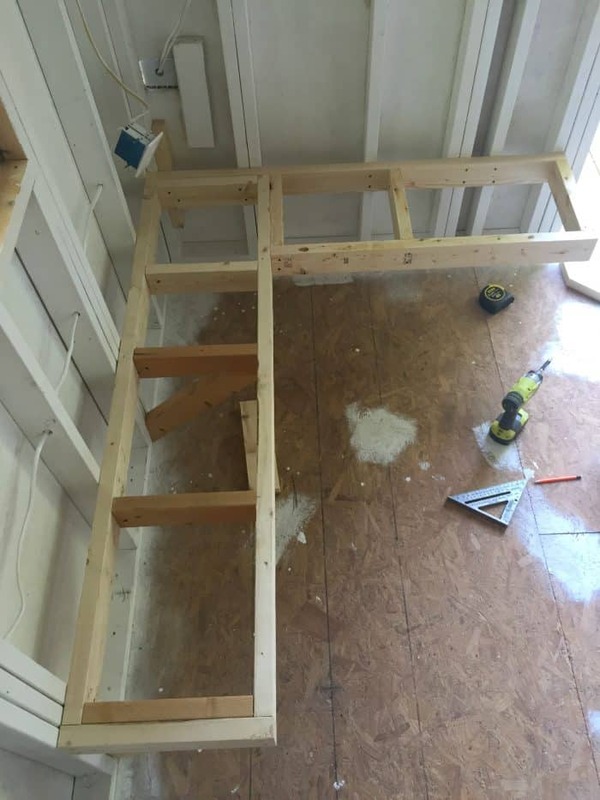 Back to the story of building a bench. My sister had a great idea to build the bench seating behind the table. Love the idea because we can use it with or without the table. The bench will also give more detail to the space. Sunday after church we got busy. This was such a basic build as you can see. 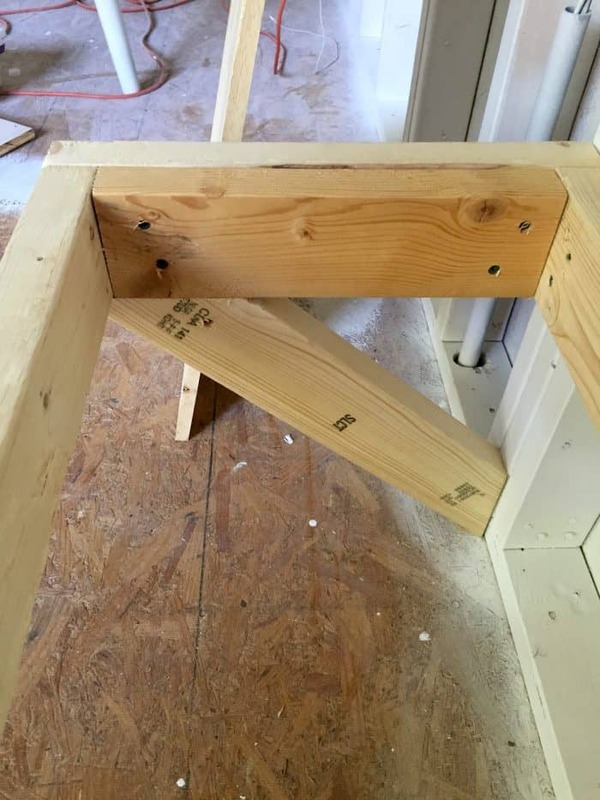 The exposed studs on the shed walls made it super easy to know exactly where to screw the 2 x 4 into. This allows the bench to be super sturdy for seating. We braced it in order to hold the weight of a person. Would not want any one sitting down and hitting the floor. I chose this type of brace instead of regular legs in order to keep the space open for easy in and out movement. Here is an inside and outside view so you can see how it is put together. Pictures are worth a thousand words, right. I love how it turned out. 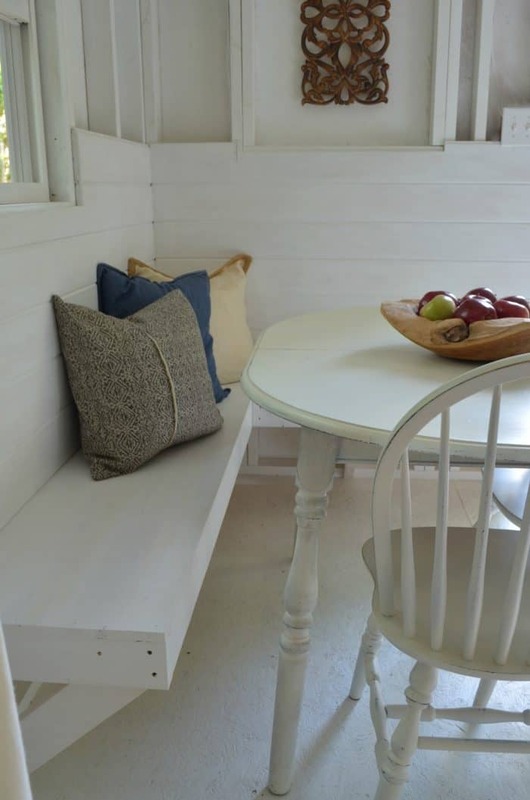 I am planning to paint it white and we will be adding something to the wall behind the bench to make it nicer to lean back. Today my husband built a serving area similar on the other side of the room. It’s coming together but I really do have lots of projects to finish. Still need to make pillows. Find plants and pots for porch. Paint interior doors, floor, bench. Create wall art for the back wall. I’m thinking Joanna Gaines fixer upper style! 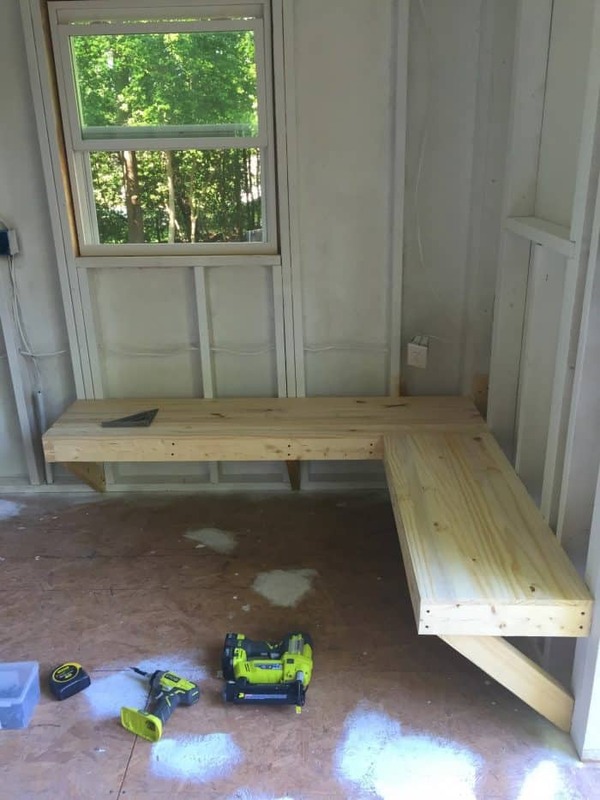 UPDATE finished shed and bench! Whew, that’s a lot. It will be worth though. If you want to look around at all of the other ORC updates, be sure to head over to Calling It Home link up party. 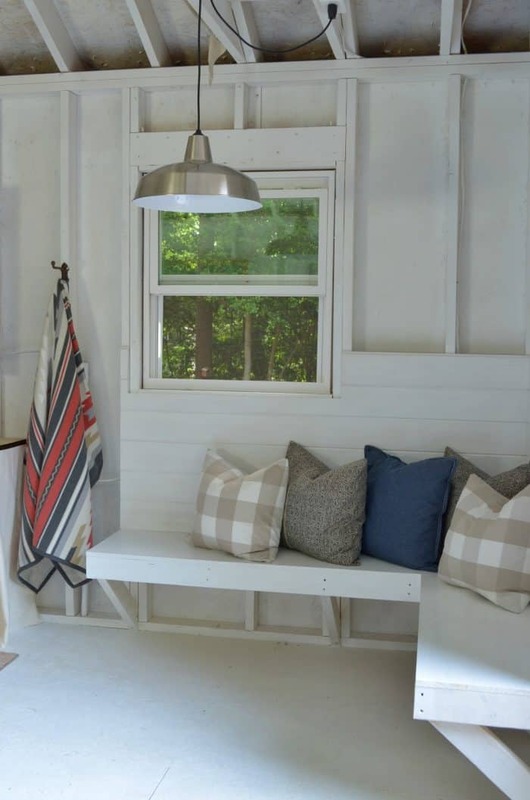 Start HERE for week 1 of the shed makeover, how it looked before and the inspiration photos. Your bench looks amazing! What a nice touch for the space. Can’t wait to see it finished. Sonya this is such a cool space to be working on. The bench build came out great and the inspirations for this space are gorgeous! Can’t wait to see how it all comes out. 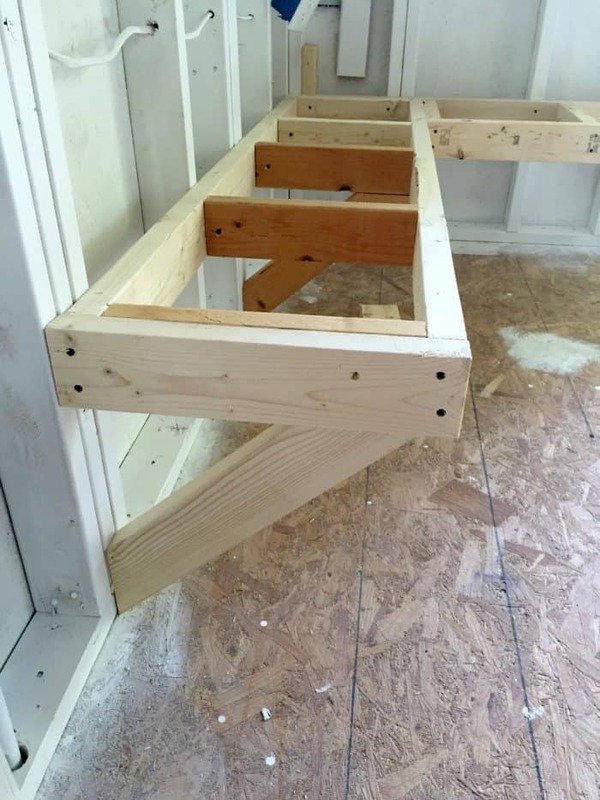 I used this method to build the workbenches in my garage. I love the fact that the legs go back at a 45 degree angle, and I don’t lose any storage space under the benches.